Divot heard Cor call for blunt weapons or magic and knew that he had neither. When Connel called for a torch Divot had an idea. Rather than a tourch, the halflng drew forth 2 flasks of oil and hurled them onto the plant wall before him. Hoepfully magical fire would light it an dburn the plants even more. If not he could always light a torch next round. Posted on 2008-09-28 at 18:25:57. Kenji heard the call for blunt weapons and fire but he didn�t have ready access to either at the moment. He stood his ground in front towards the vine wall ready to cut off any attacks that might threaten the casters since they no doubt had the fastest means of creating fire among the group. The Samurai stayed in a guard position, Katana at the ready, as Haila again cast some spell which caused small orbs of fire to spring forth and strike the vines. He smiled a little as Divot flung two flasks of oil onto the vines to help spread the fire from Haila. He nodded his approval and stood his ground between them and the dangerous vines; using himself as a human shield with his blade ready to strike only the vines that tried to get at or past him. Posted on 2008-09-30 at 11:58:10. Haven't we been here before?? A new dilemma before them, the party having hoped to gain some room to fight, found themselves instead with the plants ability to quickly reproduce, forced into a very small area. Where there had once been individual plants now a wall quickly grew, the number of plants so intertwined it was only a matter of seconds before the party found themselves suffering attacks. The first of the party to be dealt real damage was Conall his big frame a clear target, his sword sheathed, calling for a torch, the Paladin with only his shield for protection the tentacles reached and struck him 3 times. A hit to his right side, another to his left leg, yet a third grasping hold of his shield arm, this one attempting to draw him forward into the wall itself. Slightly off balance, Conall was surprised at the tentacles strength as it slowly drew him closer to the still growing wall. The next to feel the sting of tentacle thorns was the Samurai Kenji, having not a blunt weapon on him he found himself purely on the defensive, trying to protect himself and any of the party close. To him did attack five tentacles all hitting him in various locations from both legs, to his chest, a swipe to the head, and a hard strike to his neck. The tentacle hit to his neck leaving behind a thorn as a souvenir. His return defensive strikes true, three of those having struck him were cut, two shards to fall back into the growing wall, the third to fall at his feet at once beginning to grow. Divot it seemed for the moment found himself ignored by the thorny tentacles, with Conall�s call for a torch the halfling fighter did one better and so drew forth twin bottles of oil. Opened but unlit he threw them into the forming wall before him happy as the oil scattered everywhere. However, to the small fighter�s dismay a second later he found himself no longer ignored as tentacles reached for him in attack. The next attacks and actions of the other party members were not to be as Haila cast her tiny meteors into the wall before them. The wall covered in the highly volatile oil did not so much burn as explode!!. The intense heat of the magical mini meteors burning hotter then 100 torches together turned the liquid oil into a gas and set the gas aflame causing it to explode all in the span of seconds. The party trapped by the confined space was picked up and thrown into the wall behind them and into each other hard by the force of the blast, all taking damage and stunned into the next round with Althena, Divot and Haila also suffering broken bones. For Althena, 3 broken ribs, one of which if not for her armor exposed to the air. For Divot, his left shoulder dislocated and shattered at the joint of his neck, the arm useless. For Haila, her jaw dislocated, her leg bone shattered at the knee. But for all the bad news there was some good as before where there had been a solid wall now was a huge hole in its center, the ends fire fused together and not growing. The blast had also taken out the plants of #2, #5, #6 & #10 leaving an almost clear path to the first clear area. For the moment no tentacles attacked. Posted on 2008-10-05 at 03:42:49. The blast hit Cor and the dwarf found himself airborne for a moment before crashing hard into who knows what exactly. Shaking his head to try to clear the cobwebs he called out in anger, "Stupid halfling son of a goat! Did ya learn nothing last time we tried that?" Taking a moment to survey the room he noticed everyone was injured and three, including Divot, had obviously serious wounds. The plant wall in front of them had not escaped the blast either and thru the gaping hole he saw that a few of the plants behind it had vanished as well. 'Aye, tis not good.' he thought to himself. 'We need to heal but if we take time to do just that we risk the plants returning and us being back at square one and that doesn't bode well. This fight needs to be ended and quickly if we hope to survive. Perhaps it is time to take a risk.' his thoughts echoed in his mind as he weighed his courses of action. With his decision made, the knight-cleric called upon his god, "Odin guide my hand and stay our enemy." Once more Cor prepared to throw his hammers; this time both were sent spinning toward the glowing orb. Posted on 2008-10-05 at 04:26:16. Posted on 2008-10-05 at 16:02:21. "I take it back, BBQ DOES NOT MEAN BBQ OF ME!!!" Niamedris shouts mentally, his fur very much singed, making the cat look as though he had survived a volcanic eruption. Haila fared no better, and can barely concentrate with the pain she is in. She is slumped on the floor, with a sol-sized pain in her leg keeping her from moving much. There is also a tingly feeling along the whole lower portion of her head, and she can't bring herself to talk. An analytical part of Haila's mind murmurs, No spellcasting for you for now., but the rest of Haila's mind hardly hears as the signals of pain just keep coming from her body. If she opened her eyes, she would probably see she was fairly burnt as well, but she was too busy coping to bring herself to open her eyes in the first place. At last, Haila set her mind to 'ignore' enough of the pain to open one eye. Immediately afterwards she wishes she hadn't. The room seems to wheel around her, blurred, as she tries to focus on something. Eventually it settles on the one thing above her that's dynamic: that pulsing azure 'heart'. Gingerly, Haila reaches upward with one hand, with one finger extended outward to redraw the symbol. There is a brief spark in the air, seemingly from nowhere, and the rune within the circle reappears. It charges yet another flaming sphere, which Haila hits with the palm of her hand, sending it, multiplying into five, towards the 'heart' above. Posted on 2008-10-05 at 17:30:13. Kenji was blasted back as he stood in front to help guard the others behind him. He slammed hard into the wall and somehow managed to maintain a hold on his katana. As he rose he saw Haila sitting against the wall where she had fallen and she was casting another blast of her small balls of fire towards the glowing heart. Realizing he was injured quite severely, he sheathed his katana in one smooth motion and removed one of his healing potions out and took a dose from the bottle and then quickly slipped it away again. Then as Haila�s meteors streaked towards the heart he moved to stand in front of her to shield her from harm incase there was another devastating explosion. �Everyone down!� He yelled out as he spread his arms out to create a human shield to protect their powerful caster who could obviously deal out more damage to these vines then a simple samurai. Posted on 2008-10-06 at 00:35:54. Divot smiled as he splashed the oil on the vine wall thinking it would certainly burn them. Unfortunately for him and everyone else he forgot the last time this was tried and moments later he was in extreme pain. He took stock of his injuries and found them to be rather severe. It was then he heard Cor yelling at him for what he had just done. He has intended to help but it had backfired once again. 'Perhaps the party would be better off without my assistance in the future.' he thought. Then he noticed Cor was throwing his hammers at the orb and figured that he might as well at least do something someone else had thought useful. With his remaining good arm he threw his shield of throwing at the glowing orb. "Sorry, I don't know what I was thinking or if I was even thinking at all." He waited for the deserved chastisment of his companions. Posted on 2008-10-06 at 23:48:22. "Someone light a torch and the throw oil on then plants then torch them." Cynil takes the time to use some charges on her staff to create a wall of thorns in the opening and the two more in front of the two flanks of plants. Then she resume fire on the orb. Posted on 2008-10-07 at 01:40:54. What!? I can't hear you! The Orb. Conall could not stop the ringing in his own ears, perhaps that is why he could be heard for as he would speak to himself. Himself not being able to hear he was shouting quite loudly. He reached for the Footman�s mace from Cor�s belt, �If we are going to do it let us do it right,� and with Cor�s mace in hand Conall walked to the Orb and attacked. Posted on 2008-10-07 at 23:04:22. Now with the party pinned in the one corner there where many ideas being shouted about as what to do next. Cor was the first to see that where we had sliced the plants new ones grew "Hold you weapons, slicing them causes more harm than good. Perhaps blunt weapons or magic are required." So there was a new problem as where they had cut many of the plants a wall was now growing right in front of them hemming them in. As for Halia's fireball it did seem to work some plants burned and did not regrow so fire it seemed could be an answer. So then someone in the party calls out for a torch as Halia prepares a second spell of magical fire, Ulthok being caught up in his own problems with the plants was to late to react as with horror out of the corner of his eye he saw Divot toss oil on to the plants in front of him just as Halia was casting her spell all he got out before the horrific explosion was N and he felt the heat of the blast as the percussion lifted his small body up into the air and proceeded to slam him into the wall behind. When all was said and done he was at least alive and from what he could tell intact, however a glance around showed him all had not fared as well as he had. It was clear all had been burnt and battered but some much worse than others. He could tell they needed time to recover from what had just happened or some of them may not make it. The little mage quickly assessed the area and picking out as best as he could looked for a way to isolate the party with as few of the plant things as possible hoping that those who where still able to fight might be able to with torches and oil keep them back or even finish while the others where tended to, so picking his spots well and making sure all of the party would be on the side he wanted them to be, he first if it looked like anyone was farther away from the corner they where in when the blast happened he will call out and call them back towards him. To any of you who can hear me this is very important I need everyone to move towards me please. Once finished he points to the corner to his left and in a line straight along where the plants are brings into being a wall of ice. Posted on 2008-10-08 at 14:56:27. Posted on 2008-10-08 at 22:28:21. Rayne is hit and then knocked back by the explosion. She gets up but knows she had been hurt. Her first move is to look around and see if anyone is down complete;y. Her nest is to sling her bow and move to heal. Althena and haila look bad, Rayne also know she feels bad too. Althena being her first, Haila her second and then herself. Before Rayne starts healing, she calls out. "Use Healing vials if you can, I have none, I will scrape my spells for as much healing as I can do. If you have oil use it with a torch, another explosion like that may just kill us all. If not fire, try ice or bludgeoning. When the wall of ice goes up, she mutters "Well no quite like that I think the orb is the key to getting out of here." Posted on 2008-10-09 at 00:58:35. Settle Down and get some healing done Please. When Rayne replies that the orb is probally the key to getting out of here Ulthok replies to her Yes, Rayne I think we all agree that the orb is the key However I thought it might be a good idea to try and buy some time to get some of us healed and back in fighting condition before the orb makes no difference to any of us. I can always remove the wall when we are ready. Here are two, extra healing potions use them where they will do the most good, I can't do anything about broken bones or dislocated stuff but while you care for the hurt I will try to do away with the plants that are here with us then when all are healed as best as we can and we are ready I will remove the wall so don't all get up in arms Besides if the arrangement of the plants would have let me keep the orb inside the wall with us I would have kept the orb inside but it did not seem possable so lets quite second guessing and get down to work. Posted on 2008-10-11 at 11:35:44. With the combination of oil, magical fire, and plant having once again caused a greater then expected explosion it was with a sigh of relief that as the party gathered itself it was found no one had been killed by its effects, though some were badly hurt all the same. With the killer plant wall now breached the party once again had more then one choice before them, to heal, to attack, or to try to somehow escape. Haila was the first to act this round her spell of tiny meteors still very active and though hurt she was still in control. With a gesture and self induced slapping of palms the five missiles were once again on there target this time the pulsating orb. Those of the party that could followed the missiles as they raced to their target hitting the globe dead on, amid the 5 small explosions it seemed the globe for a moment throbbed differently, then as if nothing had happened to it returned to its same pulse. The next two of the party to act did so only moments apart with Cor�s axe throws beating Ulthok�s spell by a half second. With his axes released, they, like Haila�s missiles before, streaked for the globe quickly but for the first time since the party had entered the room the Globe moved!!. One minute it was in the same place the next it had teleported itself 3 feet to the right, and had discharged a ray of energy headed back towards Cor. It was here that the irony of karma reared its beneficial yet also ugly head as Ulthok�s wall of Ice came into being. The wall high enough to block the Globes energy ray from hitting Cor also stopped the dwarven Cleric�s twin axes from returning to him, hitting the wall loudly they rebounded from it to land just under the globe itself. But this was not the end of the of the parties misfortune as Divot�s shield, thrown a second after the Wall was cast, found itself trapped inside it as the ice fully formed. With the Wall of Ice separating the Globe, and its revealed energy attack, from the party and the party semi safe they quickly went to work destroying the remaining ends of the plant wall, the last two plants on their side, and the task of healing themselves. With the Wall of Ice to last the next 11 turns, it was now time to think of a way to pass this test. (OOC: OK everyone there is this week�s post, funny how the dice roll sometimes huh . Now as this, all happened before anyone else acted as rolled by your intuitive I allowed that no other spells were cast or attacks pursued so DM you still have those charges on your staff and Kyle you never had the chance to move forward. 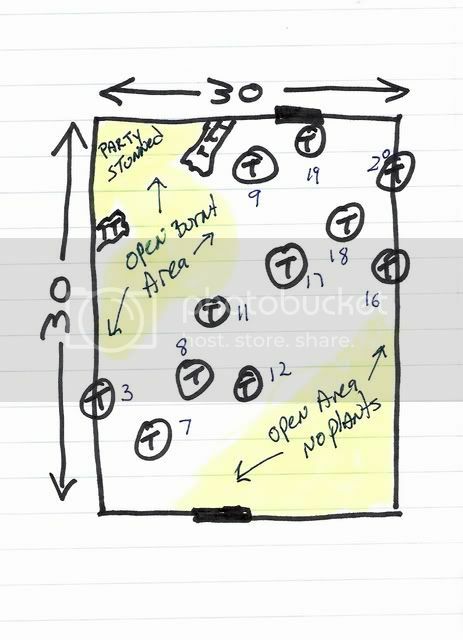 Also the map remains the same as last posted by Dragonmist except w/o both the plant wall ends or plants #9 & #19. Ok I have the healing done as follows. Rayne healing Althena and Haila then herself but which spells used not specified so no damage healed as yet. Kenji: 1 dose extra healing potion. As of Monday of this past week, I fully passed my EPA test becoming a Universal HVAC Technician and this past Thursday was my final day of school with my overall course Final which I passed!!. Posted on 2008-10-12 at 05:24:45.